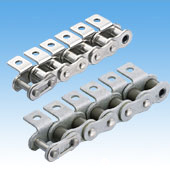 A Lambda RS Attachment Chain that has been surface treated to provide greater corrosion resistance. *NEP Series chain is made to order. Contact a Tsubaki representative for details.